This page is a translated version of the page Help:VisualEditor/User guide/Citation templates and the translation is 5% complete. 引用 menu: The "引用" menu or button is used to add footnotes. All projects have access to "基本" reference formatting and the ability to "复用" citations here. 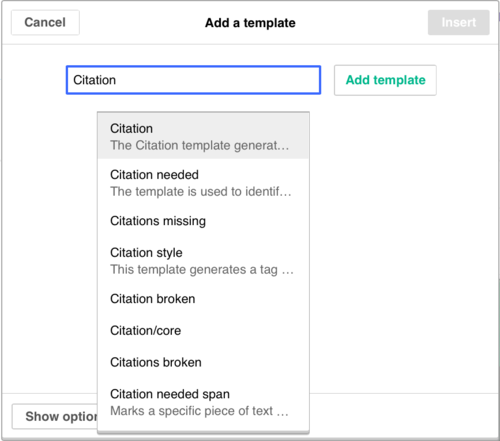 This menu also gives you quick access to local citation templates. The "模板" icon (a puzzle piece) allows you to insert and edit templates. 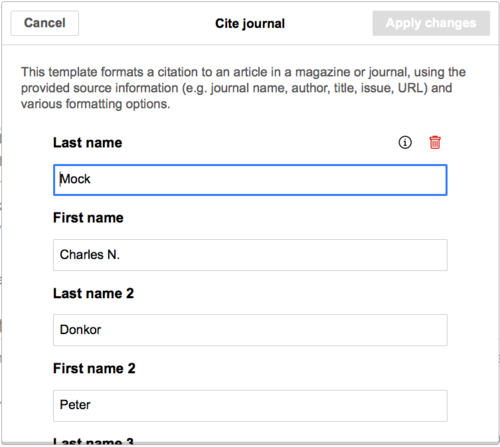 You can use this to create a citation, using a standard template, when you want a citation that is not going to be a footnote. The "参考文献列表" icon (three books) is to specify where the reader will see the list of footnotes for the page. Usually this only needs to be done once on every page. (If the page already shows footnotes, then you don't want to click on this icon.) 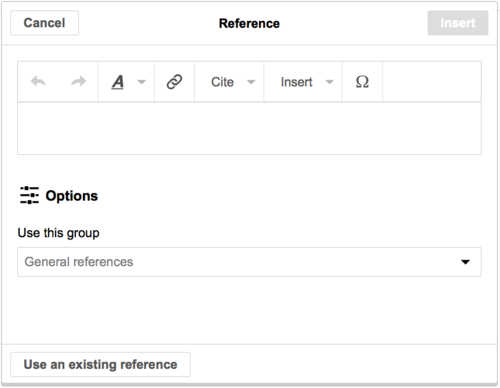 You can also set references group to display using dialog window. To edit an existing footnote, click on it where it appears in the text (usually as a bracketed number). You will then see either a "基本" icon (bookmark) or, an another icon with the name of the template that was used to create this footnote. Clicking on the "Edit" button will open a dialog where you can edit the footnote. !!FUZZY! 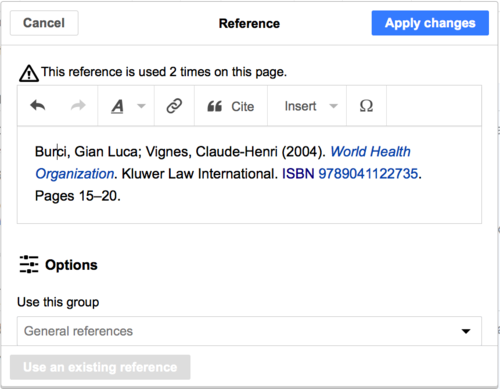 !如果，instead of the "基本" icon (bookmark), what appears when you click on a footnote is an icon for a standard template for citations, then clicking on "Edit" will take you directly to the template mini-editor dialog. To add fields, click on "添加更多信息" at the bottom of the mini-editor. Click on "应用更改" when you're done. 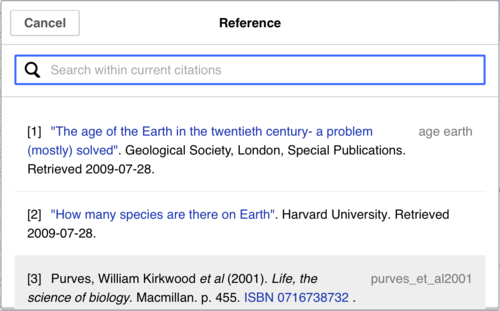 To re-use an existing reference, place your cursor in the body of the text where you want to add a footnote. Then from the "引用" menu, click on the "复用" item. In the 参考文献 dialog, look at the list for the reference you want to reuse, and select it. If there are many references, you can use the search box (labeled "在当前引用中搜索") to find only those references that include certain text. To add more parameters, scroll down in the template mini-editor and click on the "添加更多信息" option. Click on "插入" when you're done. You can also choose the "基本" item from the "引用" menu. The "基本" item is used for two purposes. You can create a footnote that doesn't use any citation template. 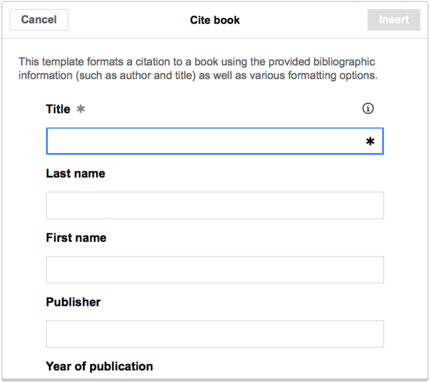 Or you can create a footnote using a citation template that is not on the "引用" menu. You can make the new footnote belong to a group other than general references, although this is normally not done. (If you do have two or more groups of footnotes, the "参考文献列表" tool must specify the group of footnotes to be displayed). In the Reference dialog, you can get to a citation template that is not (yet) on the "引用" menu. 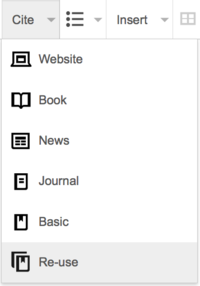 From the "插入" toolbar menu, click on the 模板 icon (puzzle piece). After you're done editing the template, click on "插入" to return to the Reference editor, and "插入" again to return to the page you're editing.